Kaya is not living at Best Friends at this time. She is in foster care in Texas, but is still up for adoption. She is a beautiful dun Mustang mare who was living at a wild horse sanctuary that went out of business. Local rescuers stepped in to save the horses from being sent to auction and they reached out to other sanctuaries to take some of the horses. 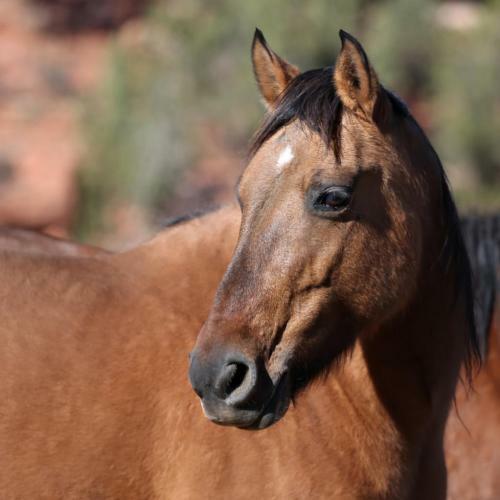 Kaya was at Best Friends for a while and was then enrolled in a program through the Parelli Foundation where she was placed with a very experienced Parelli Profession trainer who now has Kaya in foster care at his ranch. He does not consider her rideable, but feels that she is a very special horse with a lot of important things to teach people. She also would make a good pasture pal for another horse.